If the drought continues, farmers and residents may have to abandon some of the richest agricultural land in the country. 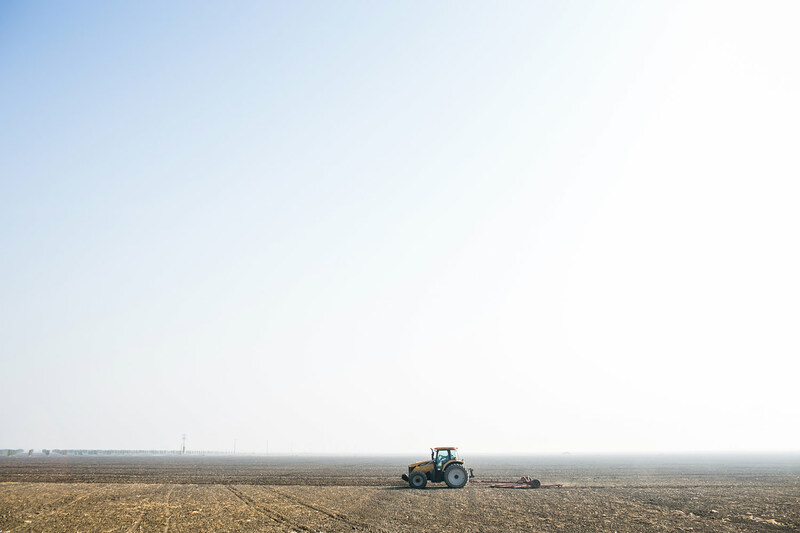 On the eastern edge of the San Joaquin Valley, at 2,000 feet above sea level, the wells of Auberry, California, are among the first in the state to tap the perennial groundwater flowing out of the Sierra Nevada Mountains. The fresh supply of snowmelt, which accounts for more than 60 percent of California’s water supply and which, since the state’s drought began three years ago, has become one of the most precious commodities in the western United States, flows down the range’s granite bedrock slopes in subterranean streams dozens of feet beneath the houses, shops and farms of the tiny foothill community. Scott Houston’s livelihood depends on those streams flowing, as well as on their not flowing. Several times a day, Houston, 49 years old and stout as a boulder, drives his eight-ton water truck to a parking lot two miles down the road from his home, connects a hose from the 2,035-gallon tank on the back of his rig to the valve of a fire hydrant atop a well, and fills it with groundwater purchased from the school district. Then he hauls the water to customers throughout northeastern Fresno County whose residential wells have run dry, for about $225 per delivery. With last winter’s Sierra snowpack at less than a fifth of what is considered normal, business this year is very good. The inhabitants of Auberry have been hit hard by the drought, even by the standards of California’s parched Central Valley region. 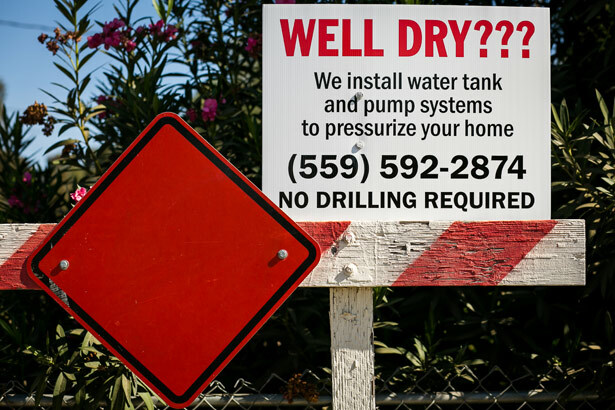 As the subsurface streams have dried up or thinned to a trickle, residents who can afford it have had to drill new wells. Unlike in the basin of the valley below, however, there is no uniformly distributed water table underlying the landscape; the water courses along discrete and disconnected pathways somewhere above the bedrock. You can make an educated guess as to where the water is flowing underfoot, but you can never be sure. You can spend tens of thousands of dollars to drive an industrial drill fifty feet into the earth and hit nothing but granite. 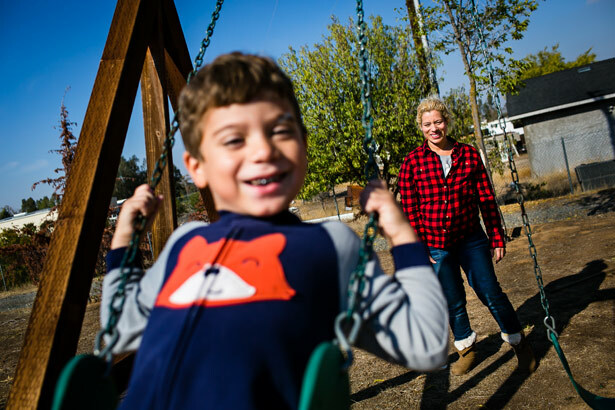 Auberry’s plight is exceptionally acute, but no part of Fresno County, or the 20,000-square-mile expanse of the Central Valley that envelops it, or the entire state of California, has been spared the water shortage. Some of Houston’s deliveries take him just a few miles down the road, such as to a nearby convalescent home that purchases around $15,000 worth of hauled water every month. Some take him down into the bottom of the valley, where the landscape changes rapidly from jagged hills, oak trees and igneous rock protrusions to flat, arid desert, sparse in naturally occurring vegetation but abundant in huge, irrigated fields of grapes, nuts and citrus. There, where the underground streams pouring out of the Sierras join and pool in a gargantuan aquifer system, landowners can be relatively certain there is water beneath their feet. The question is how far below, at what cost, and for how long. Cinthya Perez calls Scott Houston her angel. Since she ran out of water two years ago, Houston has been making deliveries to her home in Madera, in the valley basin north of Fresno. At first, it cost her $250 for each 2,000-gallon delivery, but Houston gave her a break and she now pays $200. For her family of seven, each delivery lasts about a week. Until this past September, when Governor Jerry Brown implemented new rules, the use of groundwater in California was a completely unregulated activity. If you had water under your property and you could reach it, you were free to help yourself to as much of it as you wanted for whatever purpose, regardless of whether the subsurface basin you drew from exceeded your property line and supplied your neighbors’ faucets, showers and fields as well. Perez’s troubles began when her former neighbors were forced to hand their home over to the bank after their well had failed. Before reselling it, the bank drilled the well deep enough to hit the water table again. Almost immediately after, when Perez turned on her faucets, nothing came out. Her well had run dry. The people who finally moved into the neighbors’ old house now have a swimming pool filled with water drawn from the aquifer below both of their houses, while Perez’s family eats off of paper plates to conserve the water they pay to have hauled in from a well in Auberry. 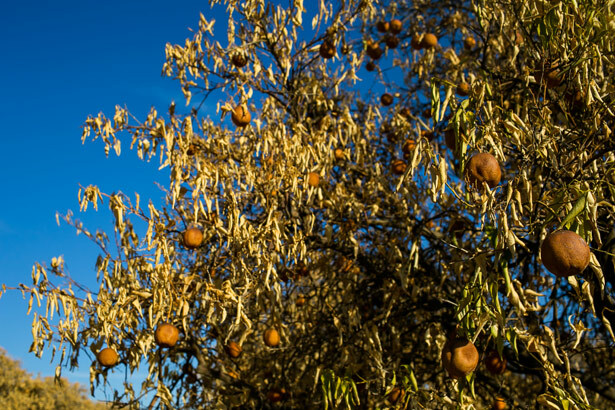 Perez’s predicament is shared by thousands of her neighbors in the San Joaquin Valley, including commercial farmers and growers who measure their use of water not by the gallon but by the acre-foot. Alongside the decimation of agricultural profits and the desperation of families with no sustainable source of domestic water, the drought’s most pernicious effect may be the ecological and economic disaster being courted by growers who are taking drastic measures to keep their financial futures from evaporating. With its alpine source depleted by what is becoming the worst drought California has ever faced, today that system is failing to furnish nearly enough surface water—water gathered from above-ground streams, rivers, lakes, reservoirs and, ultimately, mountain snowfall—to sustain the enormous agricultural economy it midwifed. Last January, for the first time ever, the state government announced a “zero allocation” of surface water from the State Water Project to the twenty-nine local water agencies that purchase it and distribute it through their networks of canals to 25 million Californians in cities, towns and farmlands throughout the state (in April, the allocation was raised to 5 percent). A month later, the federal government announced a zero allocation from its Central Valley Project, which provides irrigation water to about a third of the state’s agricultural land, to all but the most senior water rights holders. 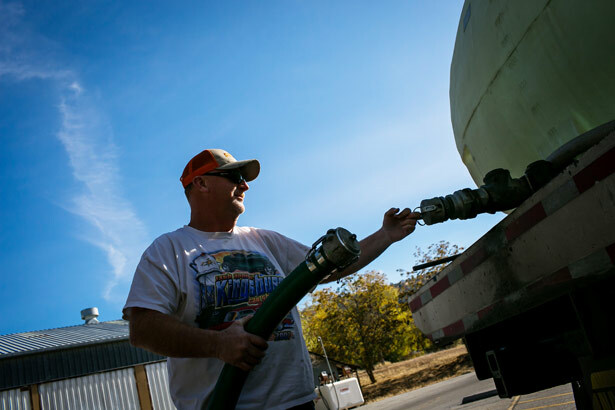 Those announcements left growers in the San Joaquin Valley with little choice but to begin pumping as much as physically possible out of the irreplaceable aquifer beneath them. 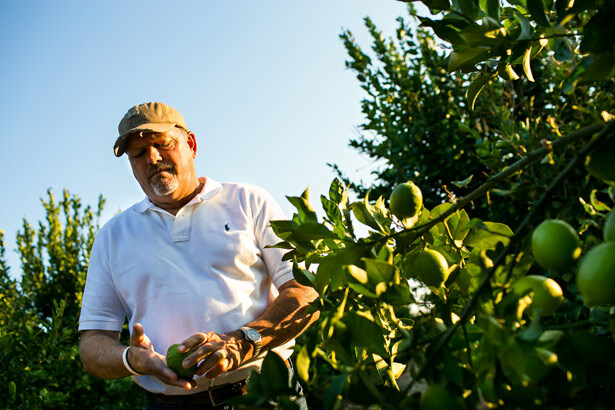 Nick Hill is a citrus grower in Dinuba, a Tulare County farming town about thirty-five miles southeast of Fresno and less than fifty miles from the edge of Sequoia National Park on the western slope of the Sierras. Hill has thirty wells on his property, most of which are down by one half to three-quarters of their normal pumping capacity. Two of them have failed completely. When the zero surface water allocation announcements were made, Hill recalls, “everybody got on the phone to call their local well driller.” The desperate rush to tap the aquifer sparked a well-drilling boom that shows no sign of abatement. “These guys are booked up somewhere in a year in advance,” Hill says. The measures Hill has resorted to in order to keep his fields irrigated, he says, have reduced his profits to almost nothing. But compared to some other growers, he is fortunate to even have options. About an hour south of Hill’s ranch, just outside of Porterville, Gus Carranza’s citrus fields sit atop a shelf of bedrock jutting out from the Sierras, making drilling a mostly useless proposition. Eighty percent of his land is dependent solely on surface water deliveries along the Friant-Kern Canal. To forestall financial ruin, this summer he bought $100,000 worth of “emergency water” purchased from other growers and farmers at close to ten times what it would cost in a normal year. The water arrived two weeks late, and he lost half of his crop. He knows other growers in the area who were even less fortunate: rather than buy water, they banked on a reversal of the zero allocation decision, and lost everything. The cost of the supplementary surface water has wiped out his savings. If the drought persists into 2015 and the zero allocation of district water is repeated, his operation will not survive. Carranza is fatalistic about the future of farming in the Central Valley. His son will soon graduate from college, where, at his father’s prompting, he is studying agricultural science. Carranza regrets having pushed his son to follow in his footsteps, which he fears lead to a dead end. He can envision a San Joaquin Valley in which thousands of former growers and farmhands and their children are out of work, with no industry to replace the one they lost. He pictures a region of destitution, crime, addiction and all the other consequences of an absence of opportunity. The grievance—for this year, at least—is in fact misplaced: scheduled water releases to the salmon run for 2014 were already curtailed in February and reallocated, in part, to growers on the west side of the valley who hold legal rights to the river’s water that predate the construction of Friant Dam. It is not the fish, but other growers who lay claim to the small amount of water being released from the dam and diverted away from Carranza’s and Hill’s thirsty fields. With a $1,500 monthly mortgage and all the expenses of a large family, Cinthya Perez and her husband struggle to come up with the additional $800 a month they pay Scott Houston for their water. During a short period when they weren’t able to afford it, they coped by lugging water from Cinthya’s father-in-law’s tank to their home in five-gallon jugs. To bathe themselves and their kids, they heated the water on the stovetop and brought it into the shower in pots. 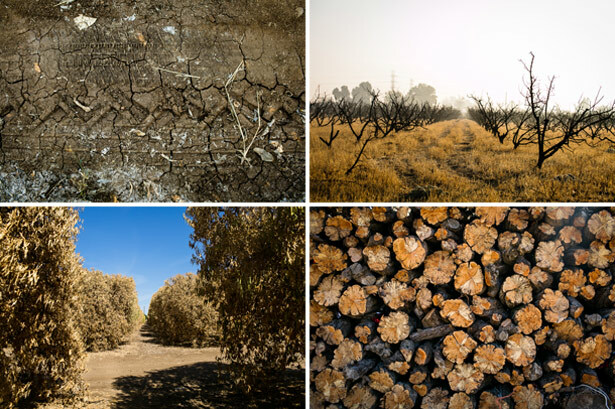 When asked about what they plan to do if the drought persists another year, Hill and Carranza offer the same non-answer: that if California does not receive ample rain this winter— and snow in the high Sierras—growers will have run out of options. Hill believes his ranches can survive, but expects massive failures by many other growers in the region. Carranza does not see a future for his operation. For its part, the state’s proposed solution is the construction of two massive underground tunnels, forty feet wide and thirty-five miles long, to pipe water out of the Sacramento River northeast of the Bay Area directly to aqueducts destined for the San Joaquin Valley, bypassing its current juncture in the Delta. The plan could cost as much as $67 billion. Governor Brown, whose father, as governor, presided over the construction of the state’s great aqueduct system that is named for him, is essentially doubling down on the historical bet that was made in the nineteenth and twentieth centuries: that one of the world’s largest agricultural zones could be planted in the middle of a desert and sustained indefinitely by the artificial importation of water through the relentless application of human ingenuity and physical force. During its time, it was a vision consistent with the contemporary zeitgeist of American exceptionalism and lingering Manifest Destiny. Today, in an age of global ecological crisis and domestic economic decline, its exhumed carcass stinks of anachronism. In one sense, the drought seems almost biblical—a Day of Reckoning for the rash and arrogant choices our civilization made in centuries past. But simply writing off the problem as a parable of human hubris does nothing to help the actual Central Valley communities that inherited the consequences of those choices and are faced with real crisis today. Moreover, as food prices increase and the national economy is dragged down by the weight of a sinking California agricultural sector, it will soon be clear that the crisis will not be contained within the valley’s mountainous borders. It won’t be as easy tomorrow as it is today to favor doing nothing. Until then, there is little anyone can think of to do but hope for rain.